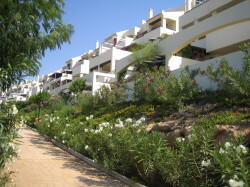 �La Ladera del Golf�, this comprises of a four storey apartment block, with lifts and stairs to all floors, a large swimming pool and childs pool, open seasonally with separate garden and childs play area. 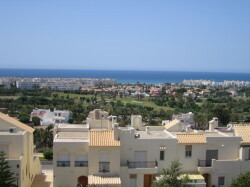 We have chosen a 2 bedroom apartment on the second floor having excellent panoramic views over the golf course to the sea, both within a 15 - 20 minute walk and undoubtedly providing the best views in Almerimar. Almerimar is centred around the Gary Player designed, mature championship golf course, including five holes featuring water and an attractive island green. There are another 2 golf courses within a 20 minute drive. Adjacant to the golf course is the marina, made up of three bays, full of a variety of craft where one can enjoy a drink in a bar or a good meal in a restaurant, perhaps sampling the local fishermans catch, all whilst overlooking the marina with the beach only metres away. Local activities include diving, sailing, horse riding, a water park, caves, nature reserves, mini Hollywood park and traditional Spanish shows, to name but a few. Just outside Almerimar is a shopping centre including supermarket, an excellent tourist information centre, cinema and across the road the new hospital. For the more adventurous types a visit to the winter Olympic village in the Sierra Nevada mountains is just two hours by car.